Potty train your baby with Pull on Pants from Naty by Nature Babycare. These training pants have tear-away sides and elastic stretch sides for comfort so your little one can easily pull them up. Nature babycare diapers and training pants are 100% chlorine-free and keep oil-based plastics away from babies delicate skin. 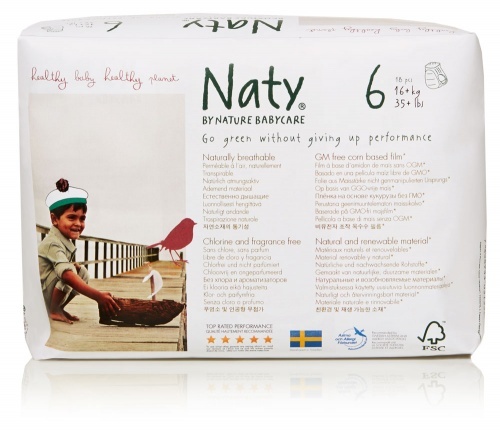 The absorbent pulp is from sustainably harvested Scandinavian forests. B. Totally Chlorine Free pulp. C. Chlorine free outer cover. No plastic. D. Distribution layer made of natural material. No plastic. 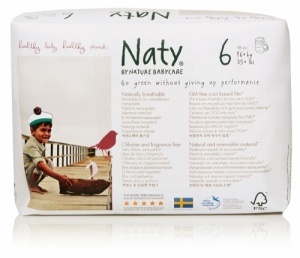 I've tried a few eco nappies and delighted with Naty baby as an all rounder. No chemically smell, no chlorine. I feel great peace of mind that there aren't any nasties close to my little one's bum! No leaks and one sees it through the night so easily. We switched to disposable pull-ups for nights after potty training and cloth nappying for more than two years. These fit nicely, are easily pulled up and down, and no leaks. I feel less guilty using a product that is atleast partly biodegradable, and don't us Moms get burdened with enough guilt. These nappies don't have that awful, toxic stench when wet that commercial, chemical laden nappies have. Having messed up my order, Siobhan was super and merged 2 separate orders for me, and refunded me shipping costs for one! Easy to use for both Mum and toddler, they don't even leak overnight!